For a few weeks now, I have been eyeing this desk. The history here is that it belonged to my in laws. When we were first married, it was in the guest room we would stay in when we visited, and I always admired it. A few years later when they were moving, the desk was slated for the garage sale. I asked if I could buy it, and bingo! Originally it was in an avocado green. I actually kept it in that color for awhile, because we had lots of green and red going on at the time. When we moved to this house, I thought a white wash would be a fresh change. But recently, the desk just wasn't cutting it in white anymore. There was so much white, it just needed something different to help it stand out. I decided it was time to give it a makeover, and so I got out the last bit of my ASCP Antoinette. I like the color so much better now! I am still figuring out the dark wax. I got a little carried away, and realized half way through that I should have started and worked in sections. My arms got a good workout going over it all! 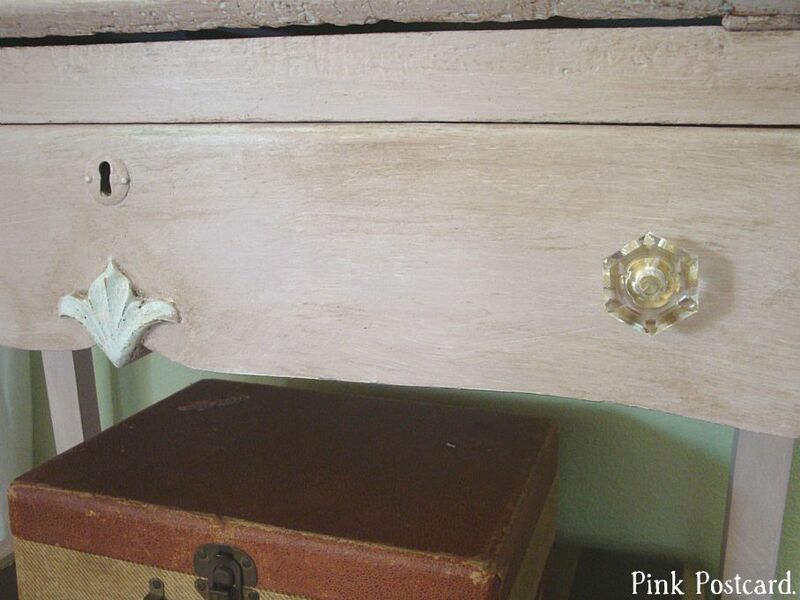 This pink is just a pretty, soft, vintage pink color. It's the second time I've used it, and I think it will be a fun color to play around with some more! Just a simple show and tell today. That desk is really cute--I would want it too. The new color looks great! What a neat desk! I love the makeover, great job!! that is so pretty! i love it in that shade of pink! Oh, it turned out really pretty. Love the shabby look. What a special piece to remind you of happy memories of family. I think it's gorgeous!! 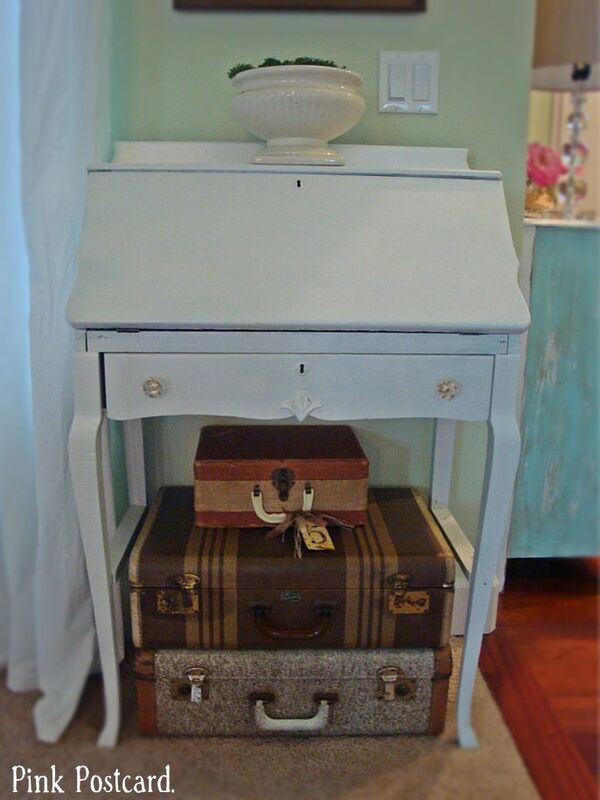 I love the vintage suitcases stacked underneath. A pretty contrast of pink and brown. Love it! I love it and I don't think you have too much brown. It's great. The distressing set it off! Pink, my fav. 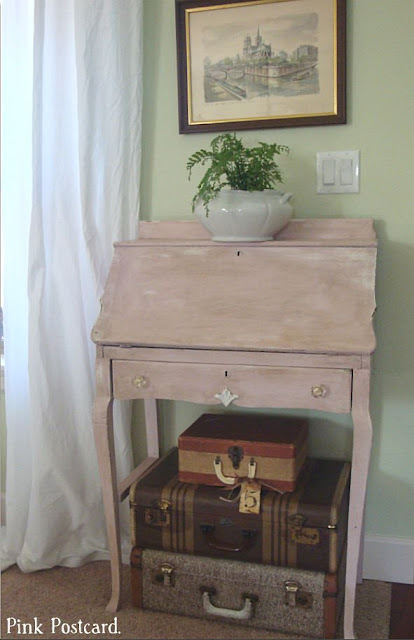 I love your writing desk in Antoinette, Denise! It's just perfect and picks up the pinks in your pretty artwork, too! 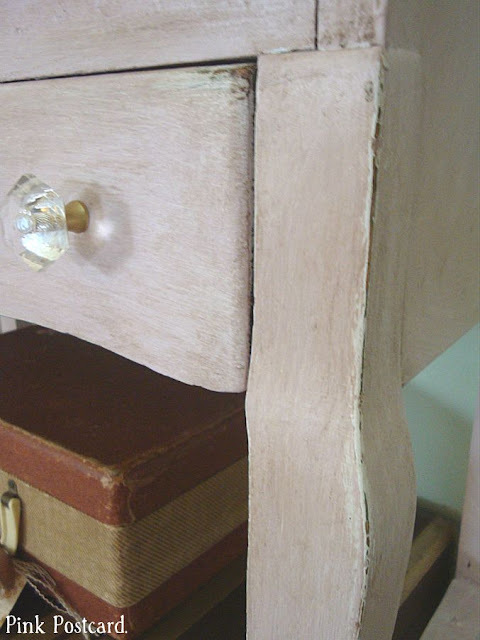 You did a great job with the dark wax as well! It's so Frenchy looking now!